Port Glasgow (Scottish Gaelic: Port Ghlaschu, pronounced [pʰɔrˠʃt̪ˈɣl̪ˠas̪əxu]) is the second largest town in the Inverclyde council area of Scotland. The population according to the 1991 census for Port Glasgow was 19,426 persons and in the 2001 census was 16,617 persons. The most recent census in 2011 states that the population has declined to 15,414. It is located immediately to the east of Greenock and was previously a burgh in the former county of Renfrew. Originally a fishing hamlet named Newark, Port Glasgow came about as a result of large ships being unable to navigate the shallow and meandering River Clyde to the centre of Glasgow. As a result, it was formed as a remote port for Glasgow in 1668 and became known as 'New Port Glasgow', which was shortened to 'Port Glasgow' in 1775. Port Glasgow was home to dry docks and shipbuilding beginning in 1762. The town grew from the central area of the present town and thus many of the town's historic buildings and people are found here. Port Glasgow expanded up the steep hills inland to open fields where areas such as Park Farm, Boglestone, Slaemuir and Devol were founded. This area has subsequently become known as upper Port Glasgow and most of the town's population occupies these areas. Newark Castle stands close to the last shipyard on the Lower Clyde. 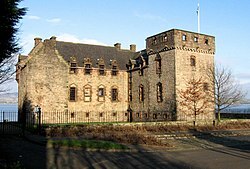 The origins of Port Glasgow go back to the construction by Sir George Maxwell between 1450 and 1477 of the "New Werke of Finlastoun", which became Newark Castle. At a good anchorage near the castle, a small fishing hamlet known as Newark formed, like other scattered hamlets along the shores of the River Clyde. After 1589 the village of Greenock formed just under 4 miles (6.4 km) to the west of Newark, and gradually became a market town with growing fishing and sea trade, although it had only a jetty in the bay to unload ships. Since seagoing ships could not go further up the Clyde due to sandbanks, the Glasgow merchants such as the Tobacco Lords wanted harbour access, but got into arguments with Greenock over harbour dues and warehouses. They put a bid in for the Easter Greenock estate for a harbour, but were outbid and the lands became the Barony of Cartsburn. They then negotiated with Sir Patrick Maxwell of Newark Estate, and in 1668 he agreed to lease the City of Glasgow 13 acres (5.3 ha) of land to the west of the castle, for payment of 1,300 merks and an annual feu duty of four merks. Construction of piers and breakwaters enclosing the harbour began promptly, and Newport Glasgow was constituted as a free port. Trade prospered quickly, and by 1710 Newport Glasgow had the principal Clyde custom house, initially in Customhouse Lane, then after 1754 in a new building constructed on the west quay of the harbour. Through that century the town became known simply as Port Glasgow. Ships, mostly owned by Glasgow merchants, imported tobacco, sugar, rum, cotton and mahogany from the Americas, as well as timber, iron and hemp from the Baltic. These goods were then taken by road to Glasgow, as was market garden produce from farms around Port Glasgow. A change began in 1773 when the Lang Dyke was constructed to deepen the upper river, and ships increasingly went upriver straight to Glasgow. In 1830, the custom house collected £243,349 3s 1d in revenue, but after that income from the port declined, while by then Greenock had its own custom house. After 1693, the grid-iron street layout, which still forms much of the town centre today, was laid out. In 1780, Thomas McGill set up one of the first shipyards in the area, located near to Newark castle. By the 19th century, Port Glasgow had become a centre of shipbuilding. The Comet was built in the town in 1812 and was the first commercial steam vessel in Europe. A replica of the Comet was built in 1962 to mark the 150th anniversary. It, and a plaque commemorating the actual site of construction, were situated in Port Glasgow town centre in the early 1970s. PS Comet, Europe's first commercially successful steamboat, was built in Port Glasgow, and a replica of her made by shipyard apprentices now stands in the town centre. Port Glasgow became a burgh in 1833, but around this time, the River Clyde up to Glasgow was deepened and new road and rail links meant that the town was no longer needed much as a port. The shipbuilding industry then took over as the main source of employment and prosperity. Port Glasgow has been responsible for about a quarter of the total tonnage of ships launched on the Clyde, and also dealt in scrapping old ships, most notably the French liner "L'atlantique", the burnt out wreck of which was broken up in the yard of Smith & Houston. However, as with most of Inverclyde's industry, the shipbuilding industry has all but gone and only Ferguson Marine Engineering remains in the town today. Ferguson's is one of the last remaining privately owned shipyards in Scotland. Ferguson's yard changed ownership in 2014 and is currently (2016) undergoing extensive renovation and modernisation, which has resulted in the demolition of most of the buildings on the site. The town is served by Port Glasgow railway station (main station) in the town centre and Woodhall railway station in the east end of the town. Both stations are on the electrified Inverclyde Line, which has frequent services to the termini at Glasgow Central, Gourock and Wemyss Bay. All trains stop at Port Glasgow; Woodhall has a less frequent service. From 1869 to 1959, the town was also served by rail at Port Glasgow Upper railway station on the Greenock and Ayrshire Railway. This station was later demolished. The town is connected to nearby Glasgow by the A8 dual carriageway and the M8 motorway. Glasgow Airport located 21 km (13 mi) to the east is the closest airport to Port Glasgow. The A8 dual carriageway runs through former shipyard land in the west end of Port Glasgow. The mansion's main entrance is in its east wing. The north range seen from the shore to its north east. See also 1, 2 3. 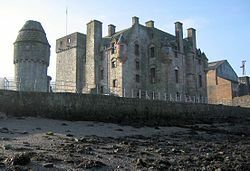 Newark Castle stands very close to the shore of the Clyde, and dates to around 1484. It was home to the Maxwell Family until 1694. By 1800, the castle was surrounded by shipyards, but today only Ferguson's shipyard remains, standing immediately to the west of the castle. A park and waterfront walkway have been constructed to the east, on the site of Lamont's shipyard and Smith & Houston's shipbreaking yard. 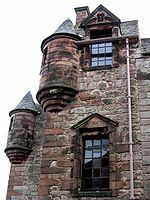 The castle is now a visitor attraction maintained on behalf of the nation by Historic Scotland. About a mile upstream from the castle and its surrounding park, several acres of the Clyde foreshore at Parklea are owned by the National Trust for Scotland. For many years, the land has been leased to the local council as playing fields. When the NTS acquired the land, it was regarded as protecting the foreshore from the widespread acquisition by shipyards. However, this did not prevent the construction of extensive timber ponds along this stretch of the river. This popular and well maintained park is located in the town centre. The park was opened on the site of the West Harbour in 1937 to celebrate the coronation of King George VI. It was expanded in the 1960s when the East Harbour and Wet Dock were filled to make way for the new A8 dual carriageway, which also cut through part of the original park. There are still traces of the old harbours and dockside warehouses to be found in the vicinity of the park. There is also an old steam hammer located at the east end of the park. There are playgrounds for toddlers and older children within the park. There is also free to use a public boat slip with a car park and good access from the A8. The park has extensive views of the widening River Clyde and the south Highlands. Perch lighthouse is located just offshore from the park, this marks a sharp bend in the navigable channel to the Upper Clyde and Glasgow. Port Glasgow has played host to several successful football clubs, including Port Glasgow Athletic F.C. and their sister side Port Glasgow Athletic Juniors F.C., which are both now defunct. Port Glasgow F.C. have been since formed to fill this void. The team returned "home" to a new stadium at Parklea, Port Glasgow in 2012, following a spell playing their home games in nearby Greenock. Port Glasgow was a parliamentary burgh as part of the Kilmarnock Burghs constituency from 1832 to 1918, when it was merged into the West Renfrewshire constituency. From 1974 to 1997, it was part of the Greenock and Port Glasgow constituency. It returned to the West Renfrewshire constituency in 1997, before becoming part of the present Inverclyde constituency in 2005. In the Scottish Parliament, Port Glasgow has been part of the West Renfrewshire Holyrood constituency since 1999. 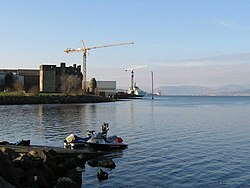 From the late 1990s onwards, much of Port Glasgow's waterfront has been cleared and derelict industrial buildings removed. The A8 trunk road now runs along the waterfront through much of the town, and landscaping has opened up the site around Newark Castle. The former Gourock Ropework building has been redeveloped as luxury flats, and a retail park has been laid out adjacent to the town centre, with a large Tesco Extra store, B&Q warehouse, Marston's Pub and Restaurant and Costa Coffee occupying the site. By October 2017, the retail park had expanded to include Marks & Spencer, Aldi, B & M, TK Maxx and Watt Brothers. During October 2017, units were being prepared for Boots the Chemist and Next. ^ "Port Glasgow (Inverclyde, Scotland, United Kingdom) - Population Statistics, Charts, Map, Location, Weather and Web Information". www.citypopulation.de. Retrieved 14 April 2019. ^ "Port Glasgow Census 2011". ^ Monteith 2003, pp. 3–4. ^ Monteith 2003, p. 3. ^ Monteith 2003, pp. 17–19. ^ Monteith 2003, p. 5. ^ "L'atlantique On Sleeve As L'anlantique". British Pathé. 30 March 1936. Retrieved 21 August 2016. Monteith, Joy (2003). Old Port Glasgow. Catrine: Stenlake. ISBN 978-1-84033-250-6. Wikimedia Commons has media related to Port Glasgow.